Recent correspondence about Dodson bodies and John Whitaker’s comment that Hastings Tramways were users of them brought this picture to mind. It is a 1928 Guy BT with 56-seat Dodson body. Thanks to Keith Harwood for his kind permission to use it, and to Chris Youhill for the information that the bus was known as ‘Happy Harold’ and for reminding me that it was fitted in 1960 with a Commer TS3 diesel engine. These Guy trolleys were the only open top trolleybuses as opposed to later conversions built. They were part of Hastings initial fleet which contained both double and single deck trolleys You Tube has a clip from a Guy Motors film about the opening of the Hastings system available to watch. Must be (have been?) fun up there when it dewired….? Yes, I agree about de-wiring. I have been upstairs on that vehicle and all the mechanism is within easy reach. It looks very easy to bang your head on when it’s not in use. I tried to imagine being an upstairs passenger during any operation. Also, sitting upstairs on Hastings seafront must have been bracing. Not only that, by the sides upstairs are very low and I think having small children up there could be interesting!! The Commer TS3 engine is a story in itself. Although it might be assumed that the TS stood for two-stroke, which the engine undoubtedly was, it actually stood for Tilling-Stevens. It was an opposed-piston engine. The bore ran right through the engine and the pistons heads met in the centre, with a crankshaft at each side, which joined at one end to form a single drive shaft. Its post-war development was hindered through lack of finance and, towards the end, most of the parts were being made by hand by TS engineers. I believe it had three cylinders, the rough equivalent of a six cylinder four-stroke engine. At Rootes Group takeover, the engine obviously showed enough promise for development to continue, with the engines eventually being used widely in Commer and Karrier commercial vehicles right through to the 1960’s. The sporty roar from these vehicles was always very distinctive. How sporty the performance actually was, I am unaware, the same with the fuel consumption. I assume the vehicles measured up to rivals well enough, as did the engine, or it would not have continued in production. Is it my imagination from the mists of time or was it actually the case that the Commer two stroke engine could, on occasion, start up and run backwards ?? I seem to remember that this could occur if the engine had previously stopped at a certain point in the combustion process. This seems a far fetched theory but I seem to recall that it was in fact true. The Commer two stroke was (in) famous for decoking itself when working hard uphill, sending large showers of sparks out of the exhaust. I remember several drivers of Commer two-stroke wagons telling me tales of car drivers flagging them down, when night trunking, to tell them their wagon was ‘on fire’ when it was actually decoking itself. The Perkins R6 engine as fitted to some 1950’s Dodge wagons (of Hell Drivers film fame) were renowned for running backwards and when this happened the rack fell off the governor and the engine raced away and couldn’t be stopped! This engine was not as successful as the P6 version which was a popular choice to convert many petrol engined coaches and lorries of the ’40s and ’50s before chassis manufacturers offered diesel options in their lighter chassis. Perhaps Chris is thinking about the R6 in his posting above. Interesting comments from Chris and Eric about engines running backwards. When I worked for West Yorkshire Road Car, Johnnie Berry, a fitter with more than a passing interest in buses, told of a similar experience. He had taken a spare bus up to Harrogate bus station from the depot, as a driver had reported his bus (a Bristol K5G) would not restart at the terminus, due to a flat battery. The driver had however, managed to bump start the bus in order to get back to the bus station. As the affected vehicle pulled in to the ‘layover’ area at the top of the bus station, Johnnie was waiting to take it back for attention. However, the driver – probably out of habit – then proceeded stop the engine. Johnnie shouted at him to leave it running, and the engine, just on the point of stopping, fortunately fired back into life. It was only when Johnnie came to move off that he noticed something was amiss, as the bus attempted to go backwards! Undaunted he tried again with the same result. Putting it in reverse allowed the gentle beast to move forwards, and then Johnnie realised that the Gardner 5LW was running backwards! He said the driver must just have caught the engine ‘on the rock’ as it was about to stop. Johnnie felt that the well-balanced nature of Gardner engines may have ‘helped’ with the ‘rock’ encountered, and was no doubt relieved that his strange experience wasn’t the result of someone putting something in his tea! Eric, comments of the Perkins R6 running backwards reminded me. my Father had dodge trucks in the 1960!s which would run backwards you had to be quick to stop it, one way that did work for him was to put a load of rag up the exhaust pipe to starve it of air. I am now a retired auto engineer. Just looked at my niece’s Renault 1.9 turbo diesel wrecked engine, speed went to max no way could it be stopped. Mechanic said the turbo goes and it runs off the oil in the sump. I can understand that they say it is a common fault. I just wonder if like the Perkins the engines happen to run backwards. Mechanics may not now remember Perkins engines. Just a thought. Can be a couple of reasons why engines of the era of Happy Harold’s run away or run backwards. Firstly most engines of that era had oil bath air cleaners, if that was overfilled with oil the engine could draw the oil in with it’s charge of air and burn it as fuel. Or you cleaned the wire gauze in the filter with paraffin or petrol and forgot to substitute oil before you fired up the engine. I believe that the fuel pumps fitted to very early TS3’s had an inline fuel pump that had symmetrical lobes on its camshaft, the cam profile meant that the injector timing was the same in both directions so if the engine got to the point of stall it was feasible to ‘catch’ and run the other way. It is to be hope your inlet manifold melted with the exhaust gases before you reversed your tipper truck over the quarry edge isn’t it!. I remember riding on the top deck of "Happy Harold" when it was running off the overhead as a child in the late fifties and feeling somewhat nervous about the close proximity of everything above. It was nevertheless a memorable experience, and I also rode on it when in summer service soon after the TS2 engine was fitted, chosen because of its relatively quiet performance I recall so as not to detract too much from the experience of riding on a trolleybus. Although I felt a little safer upstairs with the poles no longer doing the job for which they were intended and the rasp of that engine made it clear it was no longer a trolleybus. However, it is still a joy to see it from time to time, and those who work on it to keep it operational are to be congratulated on their efforts. 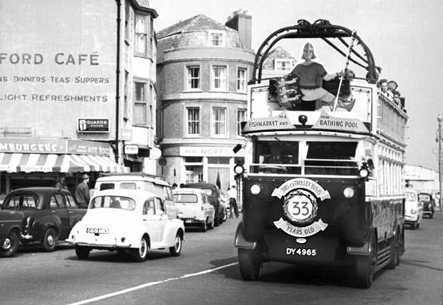 Interestingly I believe the vehicle is owned by Hastings Council which virtually takes its ownership status back to its pre M&D days. Its most interesting to hear, Doug, that Happy Harold is owned by the Municipal Authority. 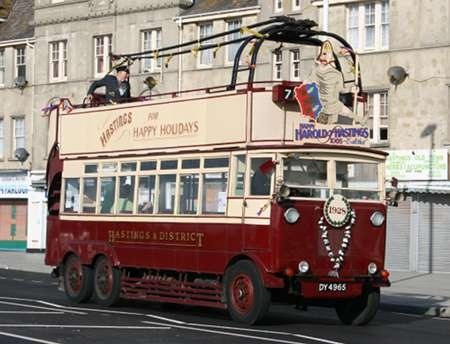 It takes me back to my childhood and teenage holiday years, when there was a magical anomaly to the sleek and luxuriously appointed modern trolleybuses having the fleetname "Hastings Tramways Company." Another delightful feature of the system was the modest humble description, on the destination blinds, of the majestic promenade of Hastings and St.Leonards as "FRONT." Indeed Chris. I was trying to think of some witty comment regarding the destination "Front" carried on the "front" of the bus. The only one I could come up with was Mitchell’s of Stornoway, some of whose dark blue Bedford SBs would show the destination "Back" (on the front!) – Back being a fairly large village, and terminus for one or two short workings on the route to North Tolsta. I had experience of riding on vehicles with the Two Stroke engines both buses in the form of Maidstone and District’s ‘Contenders’ which were Harrington integral vehicles with Commer two stroke engines and on Northfleet U.D.C. Karrier refuse vehicles (of which two had such engines). The notable thing about the buses apart from the screaming noise already mentioned, was the vibration of the engine on tick over. Every seat in the Contenders used to vibrate when the vehicle was standing still with the engine running (incidentally Paragon Kits of Northampton do a nice 1/76 Resin kit of an M. & D. Contender. Despite the sounds and the vibration, the engines were very powerful and the Contenders had a good acceleration and hill climbing ability (from my recollection superior to the AEC Reliances which they worked alongside on M. & D. routes). The same was true of the refuse vehicles whose performance was far superior to the newer and smaller Perkins engined model. Stephen, reference your comments about destinations, the trolleybuses of Maidstone showed "LOOSE", for such a wire bound vehicle it was indeed not the case! I credit the recollection of this to a book I cannot accurately recall, perhaps Trolleybus Trails by J. Joyce. Incidentally Happy Harold is still going strong thanks to the efforts of a small group and attends regularly events around the Hastings area. Referring to the Commer two stroke engine problems reminds me that in May 1963, our local coalman took deliver of a brand new Commer lorry (66 SHY) fitted with a TS2 engine. It was his first new purchase having relied on pre War Ford V8 petrol engined lorries which were by then falling apart with rust. The Commer looked splendid in bright red, black and gold but, misery began from almost the first day as it proved a real misery to start in the morning. Every day he ran the battery flat before resorting to the trusty old Ford being brought out to tow the Commer up and down the road until it eventually fired up after which in frustration he revved the poor thing to death! He sold it after only a year for a Thames Trader which ran "like a watch"! It is not commonly known that the Rootes Group were developing a 4-cylinder version of the TS3, the TS4. It was scrapped when Chrysler took over, because it conflicted with a prior agreement with Cummins/Perkins. The TS4 engine, it is said, was far superior in most respects. A few examples survive, despite attempts to have them all destroyed, along with all other evidence. This story is to be found at this link: http://www.commer.org.nz/ Another sad story, with an ending similar to that of the BAC’s TSR2 plane. If, like me, you are fascinated by Dodson bodies of this period, have a look at the same era for Wolverhampton Corporation. 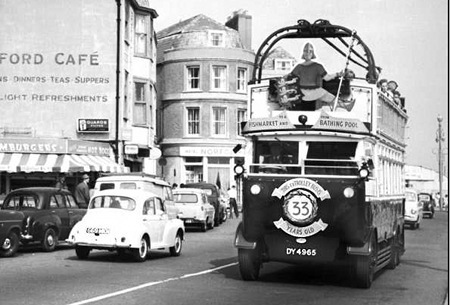 I only have books, so cannot submit photos, but they had variants of the Hastings open top Guys, with top covers, and with/without open/enclosed stairs, and also Guy CX motorbus versions with normal bonnets. An absolutely fascinating array of vintage shapes and sizes which were a "bit different", even at the time! I remember Southdown’s Commer Avengers in the late 60’s and early 70’s I drove one of the Harrington bodied examples on a Sunday evening relief to London from Eastbourne in really heavy traffic a journey that took almost 4 hours to cover the 60 odd miles. After suitable refreshment the return journey, running empty at about 22.30, took about 1 3/4 hours with the engine thoroughly decoking itself at full throttle on the Caterham by-pass with what looked like a blowlamp for an exhaust with an impressive soundtrack. I’ve never seen W’hampton Dodson’s, John and there are no photos of them on the web, but it is useful to know that they were somewhat similar to ‘Happy Harold’. The later Brighton ones were similar to the Tilling ST’s in London. Their finest hour was still the one produced for the Sunbeam Sikh and I know that you’re aware of that post. I wonder how Phil Dodson got on with his investigations? He’s not been back yet. Another evocative, post, Dave, which brings to mind the expression, ‘Went like a rocket! Clearly the local constabulary wouldn’t have stood a chance of catching you up! Two-strokes usually had the repuation of being all noise and no go, but these wonderful engines were not in that league. I had one ride in a Commer lorry when hitch-hiking when in the RAF and was impressed. Chris, if you type "Guy Motors" into Google, a site comes up with the company history, and there are 2 or 3 photos of the 6 wheel era in Wolverhampton. Reverting to the stories of engines running backwards above, it is certainly not unknown for Gardners to do this. During my time at Crosville I recall we had a Scottish Bus Group coach which managed to do this on the quayside at Holyhead. As the governor doesn’t work in reverse, and apparently nobody could figure how to turn the fuel off in time, it literally "ran away" until it blew itself to bits -very expensive! 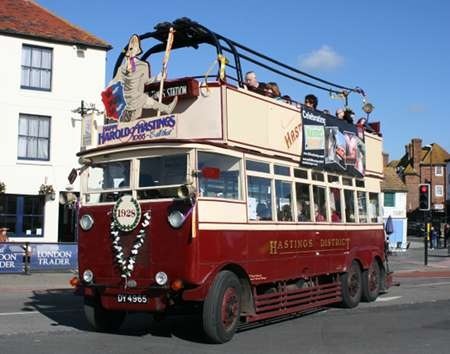 Here are two views of Happy Harold operating on Hastings seafront in October 2012 during ‘Hastings Week’, an event to mark the anniversary of the Battle of Hastings with many events taking place.